Metal Garages Direct offers metal garages to the state of Wyoming WY. 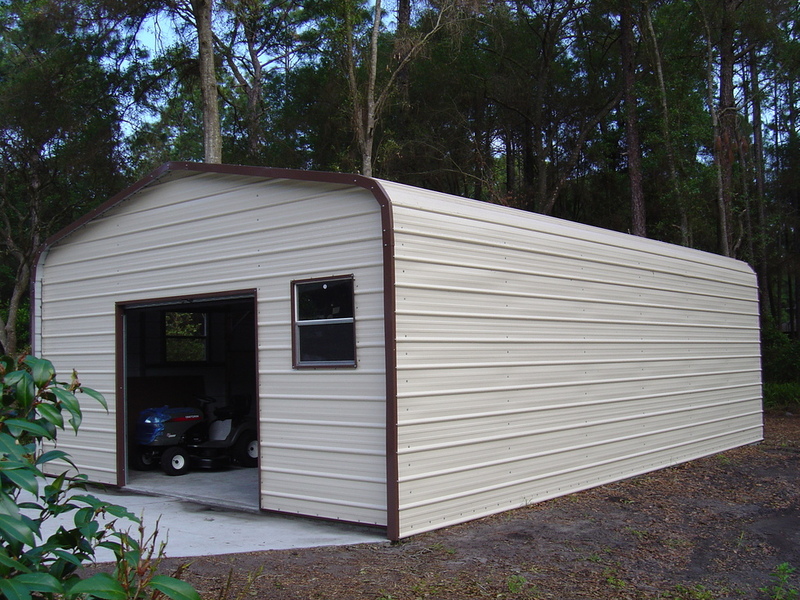 We offer our Wyoming metal garages in many different sizes starting at 12' wide up to 60' wide and as long as you want. Our garages are available in up to 18' side height. Our Wyoming WY metal garages are available in 13 different colors! In addition Wyoming WY metal garages are available in both 14 ga(no warranty) or 12 ga(20 year rust through limited warranty) and come standard with 29 gauge paneling. Wyoming steel garages are available in both certified and non certified. We also offer carports, metal barns and steel buildings! Our metal garages are great for storing cars, trucks or tractors. A Wyoming steel garage helps protect your assets from mother natures unpredictable weather. ​Unlike most companies we display our prices for you to see so check out our garage packages below! Our Wyoming metal garages are delivered and installed for free as long as your ground is level. Our normal delivery time for Wyoming are is 3-6 Weeks and up to 8 weeks. So if you are looking for a great metal garage or steel garage at a great price with quality service then give us a call toll free at 1-877-662-9060 or email us: sales@mayberrymetalstructures.com. ​Acme WY, Afton WY, Aladdin WY, Alcova WY, Alpine WY, Arapahoe WY, Bar Nunn WY, Basin WY, Bedford WY, Beulah WY, Big Horn WY, Bitter Creek WY, Buffalo WY, Byron WY, Carpenter WY, ​Casper WY, Cheyenne WY, Cody WY, Cowley WY, Dayton WY, Deaver WY, Diamondville WY, ​Douglas WY, East Thermopolis WY, Emblem WY, Ethete WY, Evanston WY, Evansville WY, Fort Washakie WY, Four Corners WY, Frannie WY, Garland WY, Gebo WY, Gillette WY, Glenrock WY, Green River WY, Greybull WY, Grover WY, Guernsey WY, Hanna WY, Hawk Springs WY, Hudson WY, Huntley WY, Hulett WY, Jackson WY, James Town WY, Jay Em WY, Jeffrey City WY, Kemmerer WY, Lamont WY, Lance Creek WY, Lander WY, Laramie WY, Lingle WY, Lovell WY, Lucerne WY, Lusk WY, Lyman WY, Manville WY, Marbleton WY, Medicine Bow WY, Merna WY, Moneta WY, Moorcroft WY, Mountain View WY, Muddy Gap WY, Newcastle WY, Orchard Valley WY, Osage WY, Pine Bluffs WY, Pinedale WY, Point of Rocks WY, Powder River WY, Powell WY, Quealy WY, Ralston WY, Ranchester WY, Rawlins WY, Reliance WY, Riverton WY, Rock River WY, Rock Springs WY, Rolling Hills WY, Sage WY, Saratoga WY, Shell WY, Sheridan WY, Shoshoni WY, Sinclair WY, Slater WY, Story WY, Sundance WY, Thermopolis WY, Torrington WY, Ucross WY, Upton WY, Waltman WY, Wheatland WY, Willwood WY, Wilson WY, Worland WY and Wright WY!